The affordably priced ProSafe FS116P delivers PoE to any small business network that wants to simplify the installation of wireless access points and IP-based surveillance cameras. These devices are optimally installed on a ceiling or high on a wall, away from most electrical outlets. PoE eliminates the requirement for a dedicated electrical outlet to power these devices. This allows for flexibility in situating devices where AC power is difficult to access and lowers installation costs. Compact and flexible, the ProSafe FS116P is ideal for small business network that want to inexpensively use PoE to deploy wireless access points and IP-based network surveillance cameras. 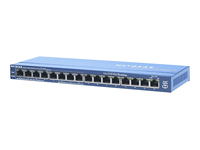 Choose to plug in up to eight Ethernet or Fast Ethernet devices and mix in up to four 802.3af IP-based devices like wireless access points or IP-based network surveillance cameras. Place these 802.3af-compliant devices where they belong - high up on walls and ceiling for maximum coverage - or anywhere else you need them. Power and data are carried over standard Cat-5 cabling. The standards-based ProSafe FS116P senses and adjusts for network speed and cabling type automatically, for easy integration into your existing 10/100 Ethernet network. For PoE, the switch automatically detects 802.3af-compliant devices, and supplies power as needed. Front panel LEDs keep you informed of switch and PoE status. Engineered for compact convenience, it is only 1-inch high and 4-inches deep, with a durable metal case that is easily positioned on your desktop or a wall, using the included mounting hardware. The fan-less design quietly integrates in your small office environment. With data switching and Power over Ethernet integrated into one unit, the FS116P saves space, reduces cables and eliminates the requirement for dedicated electrical outlets - lowering installation costs, simplifying installation of PoE-capable devices, and eliminating the need for electricians or extension cords. All in all a great benefit for a modest price.